Multiphoton microscopy has become the primary tool for in vivo studies of brain structure and activity at the cellular level in animal models ranging from small mice to larger mammals such as primates. As applications of this technique broaden, researchers continue to seek increasingly fast volumetric imaging performance to study dynamic brain responses. There has also been growing interest in accessing specific brain regions that are difficult to reach with conventional microscope designs. The Olympus Inner Focus articulating nosepiece addresses these challenges. 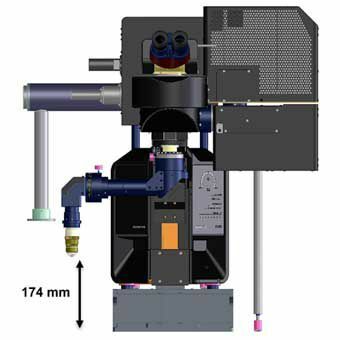 The unit can be mounted on the Olympus FVMPE-RS® multiphoton microscope to provide more degrees of freedom using a moveable arm while also facilitating rapid axial focusing with no mechanical movement. The Inner Focus articulating nosepiece (Figure 1) attaches to the standard nosepiece mount of Olympus upright multiphoton microscopes. It extends the reach of the objective lens away from the frame and provides two rotational degrees of freedom: +/- 90 degrees around the vertical axis and +/- 180 degrees around the horizontal axis, as shown in Figure 1. The articulating nosepiece provides the flexibility to access lateral brain regions even when the animal must remain upright—such as during head-fixed experiments with awake mice on a treadmill . The unit is also useful when experiments are conducted with larger animals that are difficult to orient under a regular microscope. Another key feature of the Inner Focus nosepiece is rapid optical focusing without mechanical movement of the objective lens. This is an important advantage over piezo focusing devices, especially in electrophysiology experiments where mechanical vibration can significantly alter experiment results. Further, it has a faster focus speed than a piezo device—over four times faster for a full stroke. When used in combination with an Olympus XLPLN25XWMP2 multiphoton objective, it has a maximum focus range of 550 µm. The large travel range combined with high speed make the Inner Focus unit suitable for increasing imaging throughput during large volume, in vivo multiphoton imaging applications. To better understand higher cognitive brain functions at the neuronal circuits’ level, many researchers have begun applying multiphoton microscopy to more sophisticated animal models, such as macaques . However, properly orienting large animals to view specific brain regions can be difficult under conventional microscopes. System modifications that enable off-angle imaging help resolve these mechanical challenges by enabling the objective to approach the specimen at oblique angles. The Inner Focus articulating nosepiece makes off-angle imaging with a multiphoton microscope easier. It extends the reach of the objective away from the microscope frame, providing more space to accommodate the animal experimental setup. The angle of the objective can be manipulated to approach the region of interest from different directions. Focus control by moving the stage is not practical when studying large animals in vivo. Instead, a remote optical focus mechanism enables focusing along the selected objective angle without mechanical movement of either the specimen or the objective. The Inner Focus unit is designed to maintain optical magnification and field of view across the focus range. The Inner Focus articulating nosepiece can be attached to different frames to accommodate a variety of experimental setups. Figure 2a shows the inner focus unit attached to the Olympus FVMPE-RS gantry frame option that provides a large open volume under the microscope (640 mm × 355 mm × 520 mm; W × H × D). The maximum vertical clearance of an XLPLN25XWMP2 multiphoton objective mounted on an Inner Focus nosepiece is 179 mm from the base plate. Figure 2b shows the unit attached to a riser frame option which provides up to 174 mm of clearance with a similar objective. The riser frame is another custom solution designed for researchers, such as electrophysiologists, seeking greater free space in front of the microscope rather than under it. Figure 2: The inner focus unit attached to a gantry frame (a) and combined with the riser frame (b). Rapid focus adjustment by the Inner Focus nosepiece enables researchers to record in parallel dynamic neuronal activity at multiple depth planes in an intact brain. This technique can be used to examine interactions between neurons at different depths or to simply sample more independent neurons at the same time. In the example below, the activation of neurons at two separate planes was recorded at the same time by using the Inner Focus nosepiece in conjunction with resonant scanning on the FVMPE-RS multiphoton microscope. Figure 3 shows the activation of mitral cells above the olfactory bulb in a thinned-skull, head-fixed awake mouse that was previously injected with the AAV-hsyn-flex-G6f virus. The Inner Focus nosepiece was used to rapidly switch between regions of interest at two different planes 45 microns apart while images were captured in resonant scanning mode. The two image streams were each captured at 9 FPS, for a total frame rate of 18 FPS. The activation of neurons in response to odor stimulant is visible in both planes, helping the researchers better understand the neural activities as a network in different axial planes. Figure 3: Gcamp6 response of mitral cells to MVE odor on an awake, thinned-skull mouse. The two planes are 45 microns apart, axially. The Inner Focus nosepiece enabled switching between the two planes for high-speed, multiplane imaging. The Inner Focus unit addresses several important challenges that researchers are facing, including the ability to move the objective to a region of interest that is otherwise difficult to reach and the ability to focus without moving the specimen or microscope objective. The large axial focus range combined with high speed are other advantages of the Inner Focus articulating nosepiece, enabling fast volumetric and multiplane imaging. These features make the unit ideal for in vivo imaging studies. Dombeck, Daniel A; Khabbaz, Anton N; Collman, Forrest; Adelman, Thomas L; Tank, David W (2007) Imaging Large-Scale Neural Activity with Cellular Resolution in Awake, Mobile Mice. Neuron 56, 43–57. Ming, Li, Fang, Liu, Hongfei, Jiang, Tai Sing Lee, Shiming Tang (2017). Long-Term Two-Photon Imaging in Awake Macaque Monkey. Neuron 93, 1049–1057.